Do you like rooms where you can roleplay? Are you looking for a room where you can share your love of roleplay? Click the “read more” button to find out about a room for role playing now! We’ve looked at 6 rooms so far; this time we will be looking at something a bit different to the usual rooms I review. It’s time to hop into the world of roleplay! You can pretend to be anything you want to be when role playing, whether it be a singer or a doctor, and it’s a fun way to have time with your friends. Let’s jump in to the roleplay room review now! 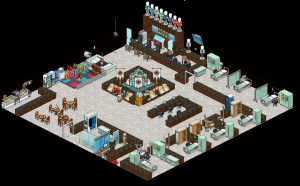 Behold [CH] Cresswell Hospital by toribabes22! Wow! 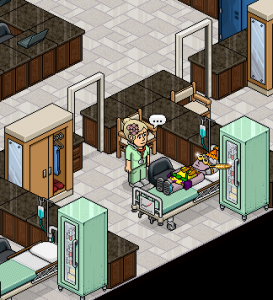 What an awesome hospital layout this is! 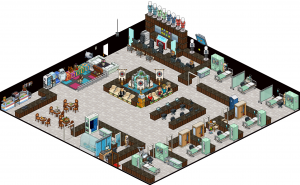 This room is owned by toribabes22, Empire, cameron446: and co-owned by QueenOfDrags. You can see just how hard they have worked on it and the end result is phenomenal. You can browse through the stickies on the wall in the reception area to find out what positions you can choose from. If you’re a fan of Holby City or Casualty (or any other hospital dramas) then you’re in for a treat! Shall we take a look at a couple of the areas in the hospital? This is a lovely area for your roleplay children to play in! They can pass the time by playing with the little toys. The Nursery / Toddler Area even has its own dog! I think this is an awesome feature of the hospital. What would a hospital be without the cubicles? There are quite a few of these in this room. I like that you can open and close the doors; it’s a shame that only security can do that though. There are a couple more variations of cubicles which you’ll see in the next part of this article. I have to say that I think the whole hospital deserves to be the heart of it! The waterfall is one of my favourite features because it adds elegance to the room. I also love how there are different colours of uniform and even a separate security uniform! If you need a refreshment or some food, go to the cafeteria; I think it’s a great feature of this hospital! 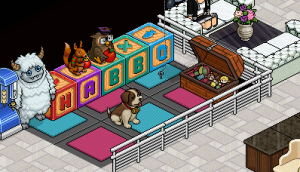 There’s a Habbo Memorial Furni to remember the old times of Habbo; I like this because older players will be able to look back on the good old days. If you want to visit this room, click here! Did you like the room? Would you like to see more roleplay room reviews? Let me know what you think in the comments section below! Be sure to take a look at the other articles on Habbox.com! There are many other features on our fansite so be sure to check them out too! Join in on the discussions and gossips at Habboxforum.com now!